We’ve had a few unfortunate accidents around the house lately — the Puppini Brothers don’t like going out in driving rain — so I’ve been thinking about house training and what we euphemistically call “accidents.” I began to go through my library of books on dog care and my boxes of paper ephemera and found a couple items to share. The first is from Francis Butler’s Breeding, Training , Management, Diseases, Etc. of Dogs. I own the third edition, published in New York City in 1865. (My copy also has an instruction from an owner: “W. H. Townsend, Detroit March 18, 1865.) How much of this book was actually written by Mr. Butler, and how much is copied from an English book on the subject isn’t known to me, but many of these types of advice books are heavily plagiarized. That said, behavior toward dogs on both sides of the Atlantic was pretty much the same, so we can take this as advice a U. S. dog owner would have found useful. Dogs are pretty quiet, during the digestive process, and should not have much exercise, after a heavy meal….Those kept in doors should be allowed to run a little after meals, when they generally require an evacuation. If a dog be regularly exercised, he will seldom even dirt around his kennel, and a healthy house-pet is rarely troublesome, except after eating. If a dog be dirty in the house, he should decidedly be broken of it, although he should not be corrected, unless he has had a fair opportunity of avoiding it. He should be invariably taken to the spot, be sufficiently twigged there, and unceremoniously scolded into the yard. It is important to catch him in the act, and administer summary chastisement. The punishment will be far more justly administered, if the animal be let out at regular intervals; this being done, he will not attempt to infringe the law, except in cases of dire necessity. Young puppies, however, must be, in a measure excused or more gently corrected, as they are incapable of self-restraint. Nevertheless they may be very early initiated into habits of cleanliness. what’s striking about this passage is how fair-minded the writer is. The responsible dog owner must give the dog the opportunity to behave well. “Twigging” I take to be hitting the dog with a bundle of small sticks. While this is certainly not acceptable practice today, it is little enough in relation to the kinds of physical punishment that were meted out to both animals and human beings at the time. I’m struck by the very modern insistence that the dog has to be caught in the act to be punished for undesirable behavior. 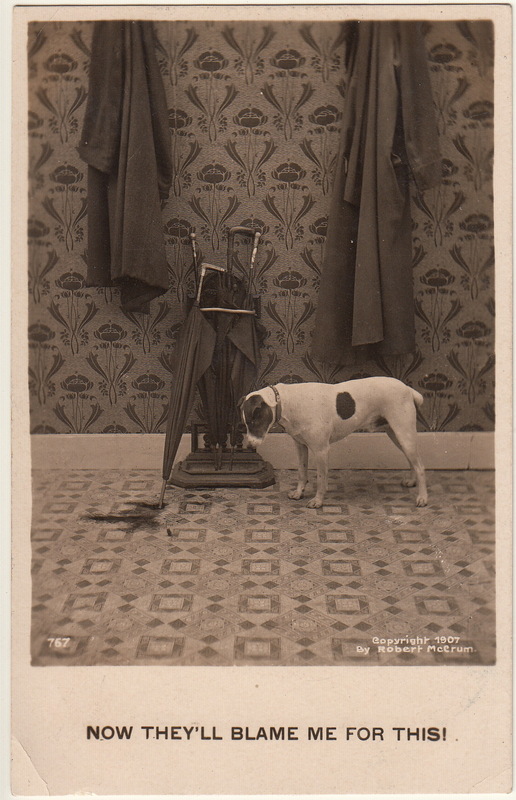 “Now They’ll Blame Me for This!” Photographic postcard. Robert McCrum, published, 1907. In 1907, the postcard publisher Robert Crum released this comic card that tells us something about dog and owner behavior at the time. Faced with a puddle left be an improperly stored umbrella, the family dog worries about being punished for something he didn’t do. The implication is that he’s worried because he has made similar puddles in the past, and that the owners have punished him after the fact. And the published clearly assumed that purchasers would find this funny because it reminds them of their own dog. Finally, here’s a passage from a 1921 book written by a veterinarian, Roy H. Spaulding, whose credentials include service as the “resident veterinarian at the New York Women’s League for Animals. Your Dog and Your Cat: How to Care for Them is very much directed to city people who wish to keep pet animals. Cleanliness about the house is very essential in a pet. Every puppy must be taught where he is to clean himself, for they have no other way of knowing. In the apartment where a pan of sawdust or newspaper is provided, it should be so placed that the animal can at all times have access to it, and it should always be kept in the same place….As soon as he arrives he should be immediately taken to the paper, and, if possible, kept there until he uses it. The paper is then left where it is, so that later in his travels about the house when he comes upon the paper, he is attracted by the odor and induced to use it again….Of course, sooner of later, he is bound to misbehave, and then he must be shown what he has done and severely scolded. If, however, he persists in this, it will be necessary to punish him, provided this can be associated with the misbehavior. Dr. Spaulding then discusses training a dog to relieve himself outdoors. The amount of time associated with paper (or sawdust) training, however, suggests that many of his clients are living in apartments. The paper or sawdust pan is an early version of the “wee-wee pads” that some pet owners purchase today. Next A Mysterious Family Photograph, 1895 — with Dog!